Portovenere, Cinque Terre, and the Islands (Palmaria, Tino and Tinetto) are the result of human impact on the steep slopes along the Ligurian coast. The landscape is heavily terraced for agriculture (vines, olive trees). 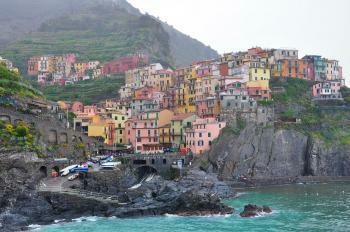 I visited Cinque Terre on a day trip by train from Genoa. It's an infrequent local train, that takes almost two hours. The train is frequented by a group of beggars, all sharing the same written plea for money in Italian and English to feed the (same?) wife & 2 children. The closer you get to Cinque Terre, the less you see of the coast line as the train passes several long tunnels. Glimpses of the countryside showed palm, orange and lemon trees, all under long-awaited rays of sunshine. I got off at Vernazza, my goal for the day and reportedly the prettiest of the Cinque Terre villages. Most of the train carriages are still inside the tunnel when it stops - that shows how small the usable land area is against the cliffs. Only a handful of other tourists got off, how different from summer when this village is overrun by them. Locals now have the streets to themselves and greet each other ostentatively. The famous hiking path, that connects all 5 villages along the coast, unfortunately is closed during the winter. I had to make do with climbs up to various viewpoints - as this is what the fuss is all about, the tremendous views over the colourful houses of the village, the wild sea, the steep cliffs and the agricultural terraces. There's not much (probably nothing) to see in the village itself. So I ended up at a harbour restaurant , where I ate a very fine lunch of Trofie al pesto and mussels. I found a lot of the visitors just focus on the towns and don't want to do too much hiking. It wasn't overly busy on the trails and I found it really relaxing. As well as doing the main path, I also did some detours so I could see a bit of the agriculture on the hills that are one of the reasons it has been listed. 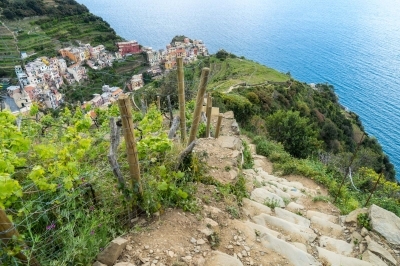 If it helps, I have put together this guide for hiking Cinque Terre. One of the recommendations I make is to stay in nearby La Spezia and use that as the base to explore - including to Portovenere. In July 2014, from Genoa we took a regional train from Piazza Principe station 26 stops all the way to Vernazza, where we stayed for two nights. In a fairly busy two days we managed to visit all of the villages and islands of this WHS, making use of the footpaths, railway and ferry service. 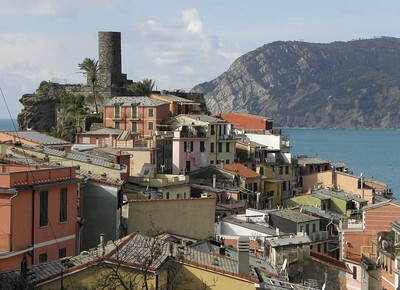 The first village, starting from the west, is Monterosso. We travelled there by train in the evening and relaxed for a while eating bruschetta and ice cream. 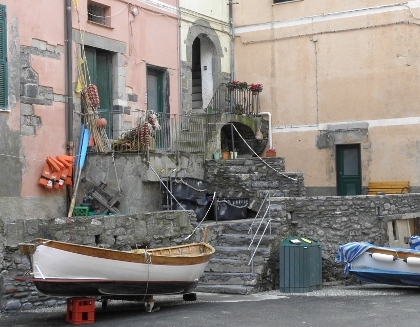 The next village along is Vernazza, where we stayed. People say it is possibly the prettiest village, along with Corniglia. Unfortunately several of the inter-village footpaths were closed when we were there, which I understand is not uncommon because the steep hills are prone to landslides. 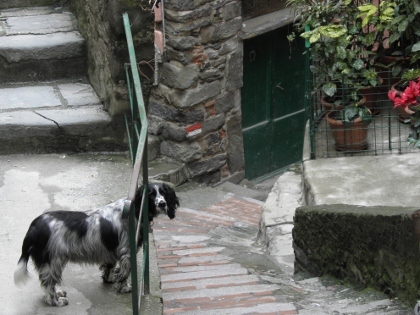 The most famous (and easiest) of the footpaths is the Via dell’Amore between Manarola and Riomaggiore, but it was one of those closed off. We instead walked the path from Vernazza to Corniglia, which is 3.6km and not for the faint hearted. It goes up and down and up and up and down, but it rewards you with great views of the coast and the sea. Because the village of Corniglia is located high up on a promontory, it is the only one you cannot land at by ferry, so it was lucky that it was the one we managed to walk to. The next day we set off bright and early on a ferry ride that would take us to the other two villages of the Cinque Terre and then on to Portovenere and the islands. There were just enough ferry services in the day for us to be able to get off and spend some time at each of the villages. First stop for us was Manarola, where we climbed up a hill in order to get the view above. The town was packed with tour groups so we didn’t hang around too long, plus we had to get back to the ferry in order to carry on with our planned itinerary! Riomaggiore is possibly the largest of the five villages, and probably the easiest to photograph. We spent a while there at a bar, enjoying the view and cooling down. From Riomaggiore it is 12km down the coast to Portovenere, formerly a Roman settlement known as Portus Veneris. Included in the daily ferry ticket was the option of an island tour, which made the otherwise rather pricey €27 fare worth it (for me at least). It is not the most interesting boat tour you will ever go on, but it allowed me to the see the islands that I would not otherwise have been able to: Palmaria, Tino and Tinetto. Italy's coast is blessed with a number of beautiful regions - Amalfi is probably the most famous, but Cinque Terre doesn't come far behind. It is quite close to the nice port city of La Spezia, which makes a good base for exploring this region. The mountains reach as far as the coast, resulting in a breathtaking landscape of cliffs, islands, and forests. 4 of the 5 villages are on the coast, only one (Corniglia) is up in the hills. The villages are all connected by hiking trails (even though 2 of them, including the famous Via dell'Amore, are currently still closed because of the lasting impacts of the devastating landslides of 2011), but the best way for non-hikers to discover them is by train. There are regular connections (at least once an hour) between all villages, and the rides only take a few minutes each. The downside is that the trains are all very crowded and you have the feeling that you are on the Tokyo subway during rush hour (My guidebook advised to avoid summer and any weekend between Easter and September - well, I went there on a weekday in October and it was still extremely crowded...). My favourite villages were Manarola and Vernazza (most picturesque), and I also liked Corniglia (great views and not so crowded because you have to walk uphill to get there - or take a shuttle bus from the train station). Riomaggiore and Monterosso are also nice, but I didn't find them as attractive as the others. I went from La Spezia to each of the villages, and finally took the boat ride from Monterosso back to La Spezia, which is really very scenic and gives you a whole new perspective. The next day, I took the bus to the pretty village of Portovenere, which is famous for the church of San Pietro with its exposed seaside location. I had planned to take a boat ride to or around the 3 islands off the coast that are also included in the WHS, but there weren't any rides offered on this day (even though the sea was very calm, but there were probably not enough people). Anyway, after a very brief visit to the area in 2006, I am glad that I finally had more time to spend in this beautiful region. I visited this WHS in August 2013. Since I knew that the 5 Terre were quite popular, I decided to stay longer and sleep over in Volastra for 3 days. Travelling by car is not a viable option so I decided to park my car and enjoy the several hiking trails. Great views and not too many people (probably because of the scorching sun!). Each of the 5 Terre is unique but my personal favourite was Vernazza (and the hiking trail from Corniglia through the vineyards). Manarola and Riomaggiore are the most photogenic but also the most crowded. Best time to visit is just before sunset. I travelled through the Terre by train too but would skip it next time round. Too crowded and practically you don't see anything! I did the boat trip from Monterosso to Riomaggiore at sunset and it was a very pleasant trip to see the colourful houses from another perspective. My highlight however, was staying over on Palmaria Island just opposite Portovenere! Portovenere itself is less crowded and very interesting to visit. However Palmaria island after 6pm is empty and the sunset views over Portovenere are spectacular. I did the round the island hike to see Tino and Tinetto islands to pretty much cover all the sites inscribed in this beautiful WHS. Visiting the five coastal villages was very easy using the frequent train services. Too easy, for although the villages were colourful and picturesque, they were also overcrowded with tourists and the accompanying fast food and souvenir stalls. So when I went by bus P from La Spezia to Portovenere I was areeably surprised to find an equally colourful village, but without the crowds. I walked through the narrow street in the centre of the village to see St Peter's church and Byron Bay, then returned along the waterfront. After a sumptuous seafood lunch I took a cruise to see the three islands with their exposed cliffs and abandoned monasteries. After Genoa, I continued my travel along the beautiful Italian Riviera to Cinque Terre or Five Lands, the area of breathtaking landscape of five villages of Monterossa, Vernazza, Corniglia, Manarola and Riomaggiore which dramatically built on the rugged and steep coastline. The beauty of Cinque Terre was truly deserved its well reputation, all five villages were extremely pretty with small colorful houses with lovely vineyard and green mountain as their background while facing the greenish blue sea, maybe one of the most beautiful place in Italy in my opinion. I used train for transportation in this area as it seemed to be the most convenient and cheapest with special one day pass. Travel by train was a very nice experience to see Cinque Terre as most of the rail line built along the beautiful coastline and it’s really unique that most of the villages could only be reached via pedestrian tunnels from the tiny train stations. The tunnel of Riomaggiore made me feel like walking in the aquarium. Each village has its own characteristic, but for me Manarola is the prettiest and very photogenic especially when you walk from Corniglia and see Manarola for the first time. Cinque Terre was also famous for seafood and wine, and I had to admit that I really enjoyed its wine more than the gorgeous landscape! Another highlight of Cinque Terre is to walk on the famous “Via dell Amore” or the way of love, a lovely coastal part between Manarola and Riomaggiore, the part was full of flower and cactus and one statue of kissing couple, lovely but not so romantic than I expected and actually quite dirty with hundred of graffiti of love, also be noted that the whole Cinque Terre was a national park, so 5 EUR fee for enter. All in all, I really enjoyed my visit to Cinque Terre; this area had everything you expected from famous tourist attraction, great landscape, good food, perfect transportation and sense of discovery and adventure. I don’t know that Cinque Terre was unique or not as many people compared it with another famous coastline of Amalfi, but in my opinion, Cinque Terre is deservedly to be inscribed as a UNESCO World Heritage Site and should be seen if you are travelling in this area. 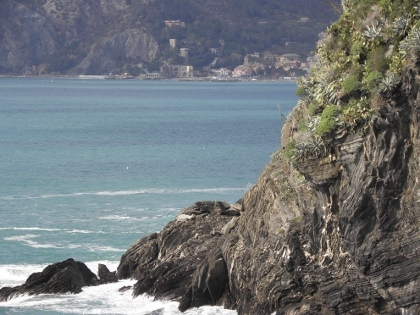 When we were visiting the region Liguria, we have decided to visit the jagged coastal zone of Cinque Terre, 15 km long. 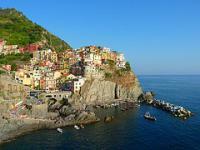 We have visited the five small villages of the area: Monterosso al Mare, Vernazza, Corniglia, Manarola and Riomaggiore. They were disputed by different noble families before they became part of the Republic of Genoa and are very particular because in front they have the sea and behind them the mountains (Apennines) falling in it. The landscape is beautiful and has a few hectars of vineyards and olive cultivations, some of them longer than 2 km, terraced by drystone walls and beach pebbles. The villages are picturesque because they are built on the rock and have nice winding streets with small houses with stone roofs, grouped around churches, castles, harbours for fishing boats and now culverted streams. Monterosso al Mare is situated in a valley and you can see there the Gothic churches of St. John the Baptist, with a high tower (a former isolated watch tower), a front with strips, a rose window and a porch, and St. Francis, that contains important paintings of Van Dyck, Bernardo Castello, Bernardo Strozzi and Luca Cambiaso, the remains of a castle, of the walls and of the Tower Aurora, the oratories of the Death and of the Holy Cross. In Vernazza (constructed on a rock) you can find a main road going to the square where overlooks the apse of the Gothic church of St. Margaret of Antioch, that has two levels, the Franciscen convent, the remains of the walls and a tower. Corniglia is the only town built on a promontory, where you can admire the church of St. Peter, reconstructed in Baroque style, that has a Gothic portal and rose windows, the Oratory of St. Catherine and the House of Fieschi. In Manarola (a small village constructed on a rock) is the the Gothic church of St. Lawrence with a tower, a nice rose window made by Matteo and Pietro from Campilio, some relieves and altars, the remains of the walls, the oratory of the Assumption of the Virgin and the leprosarium of St. Rocco. In Riomaggiore there is the neo-Gothic church of St. John the Baptist, with a Gothic rose window, the nice remains of a castle, the Chapel of St. Rocco and the Oratory of the Assumption of the Virgin. I liked very much this landscape because of the beauty of its towns and of the scenery. It's worth to be visited if you are in Liguria (it's hard to get there and the best way to do it is by train and the centres are closed to the traffic) and justifies the inscription, even if maybe it can be extended to the coastal zone as far as the promontory of Portofino and inscribed also under natural criteria. We had tickets to fly to Italy from California, September 12, 2001. The 9/11 disaster changed all that. My mother, brother, and daughter had planned to go, and when a week later we were able to fly out, my mother had decided not to. So it was with great excitement, and some fear, that the three of us left for Venice. We almost immediately boarded the train after reaching Venice, and headed west to our first destination, Monterosso on the Cinque Terre. in the US, the uncertainty, staying in Monterosso was the perfect balm, so soothing and peaceful. The historic ambience is amazing. I didn't realize it was a World Heritage Site at the time but having been to others around the world now can certainly attest to its qualifications. I've just returned from the Cinque Terre. We stayed in a lovely small (10 Rooms) hotel Luna di Marzo, in the ancient town of Volastra, just above Manarola. What a view, from our room we could see Manarola, Corniglia and in the distance Monterosso al Mare. The hospitality shown us was wonderful! We fell asleep and awoke to the sound of waves, birds chirping and the coolness of the fruit orchards that surround this heavenly spot. We travelled to and from Manarola on the local mini-bus, 5minute ride, walked the very easy "Via del Amore" to Riomaggiore,then took the train and lunched in Vernazza, then onto Monterosso al Mare for a two hour pause on the beach and a dip in the cristal blue waters. We returned to Manarola by boat (25 minutes)to experience the 5 Terre from every point of view. It's spectacular from every angle. Surprisingly for the end of July we didn't find suffocating crowds. The organization for tourism is very good, and with great respect for the environment. We will return! By the way the fish, wine and pesto dishes are divine! Tunnels: Cinque Terre for pedestian tunnels connecting railway stations and towns of Manarola and Riormaagiore. Lord Byron: Byron's cave. As a plaque there reminds us, "this grotto was the inspiration of Lord Byron. 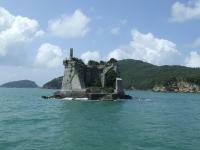 It records the immortal poet who as a daring swimmer defied the waves of the sea from Portovenere to Lerici" in 1822.